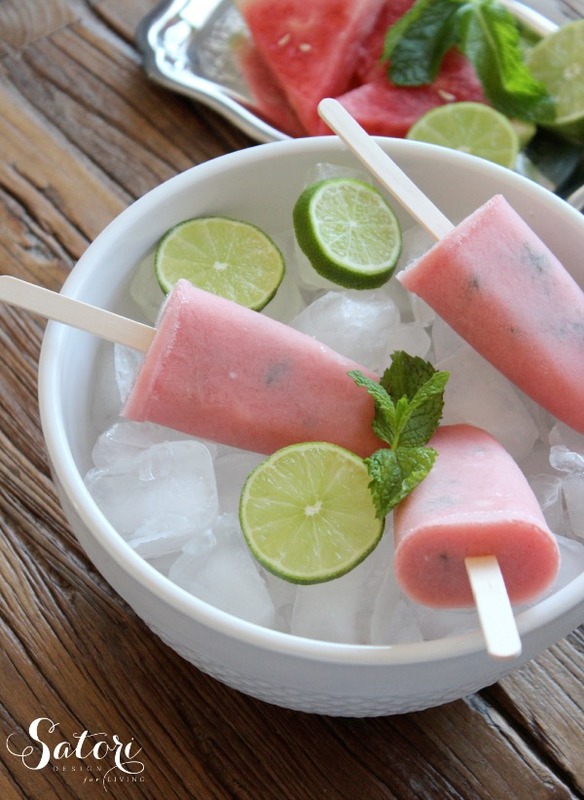 Watermelon mint paletas are made with fresh fruit and Greek yogurt. A satisfying, delicious and healthy summer snack everyone will enjoy! Summer has been hot, hot, hot around here the past couple of weeks, and that means everyone’s trying to stay cool. Everyday, I make a batch of homemade iced tea or infused water that disappears in no time. On particularly hot days, nothing seems to be as satisfying as frozen treats, especially ones that are jam packed with summer fresh fruit! While we were in Mexico some time ago, they served paletas aka popsicles poolside in the afternoon. Everyday was something a little different- banana, piña colada, strawberry and more. I remember how refreshing they were! The best part about paletas is they’re made with real fruit and wholesome ingredients instead of preservatives or chemicals like the store-bought varieties. So, go ahead and enjoy one (or two), guilt-free! Add watermelon, lime juice, yogurt and honey to blender and puree until smooth. Stir in fresh mint. Fill molds, leaving a bit of space at the top. Freeze until mixture starts to set around the edges of the mold (about 1 hour). Insert popsicle sticks. Freeze until solid (about 4 hours or overnight). Dip molds briefly into hot water to remove the paletas. Enjoy! 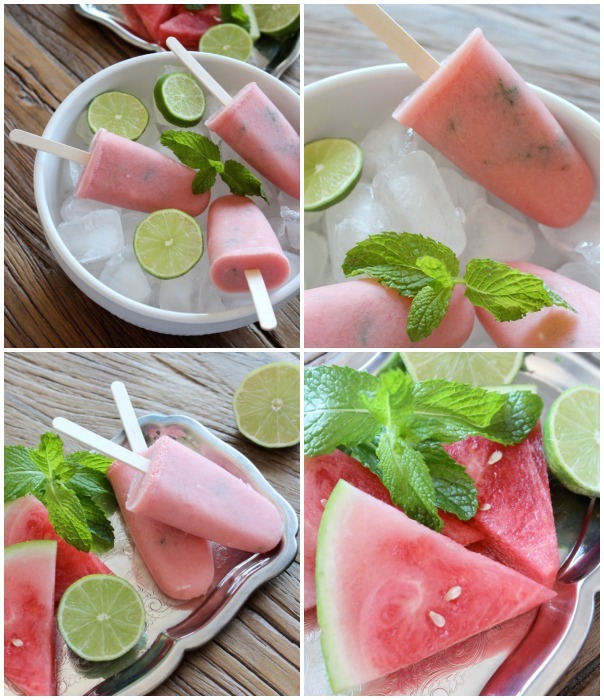 Be sure to pin this healthy, refreshing and delicious watermelon popsicle recipe! 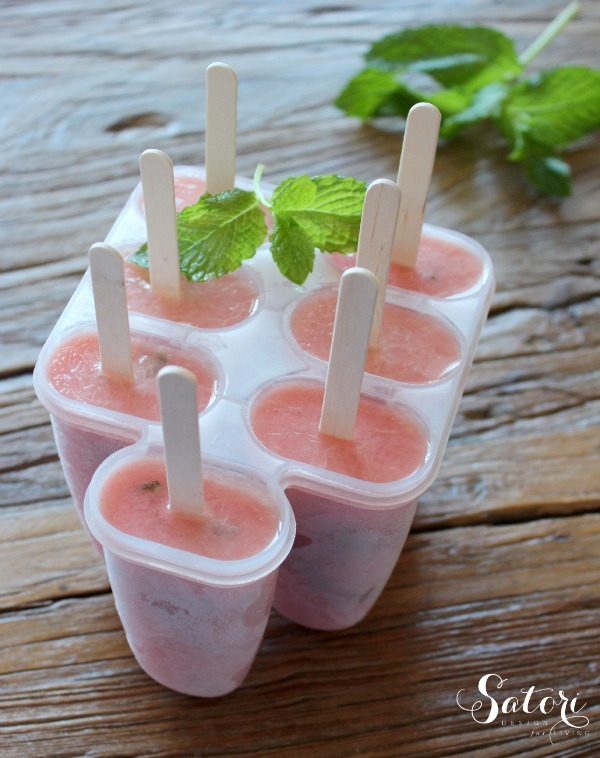 These frozen treats are made with fresh fruit and Greek yogurt- a tasty, healthy and satisfying summer snack! Now for even more summer cool treats! 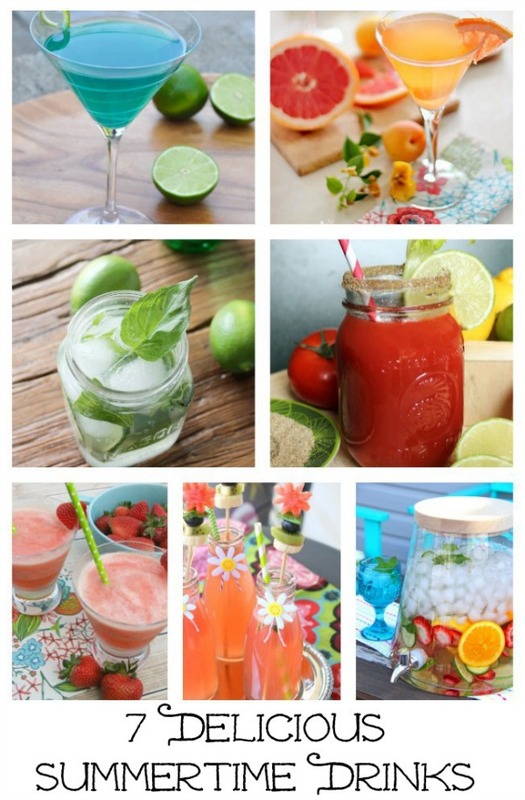 For even more refreshing recipes, check out our Summertime Drinks Hop! They look like heaven on a hot day!! Yes, especially on a day like today when it’s hot! The popsicles look great Shauna! The kids here just love watermelon so I’m going to definitely give this a try. All the others look good too, much check them out – thanks! So simple to make and my “boys” are eating them like crazy. Let me know what they think! These look so fresh and cooling, Shauna. Yummy! These look so good! I never would have thought to use watermelon and yogurt. We’ll definitely be making these. 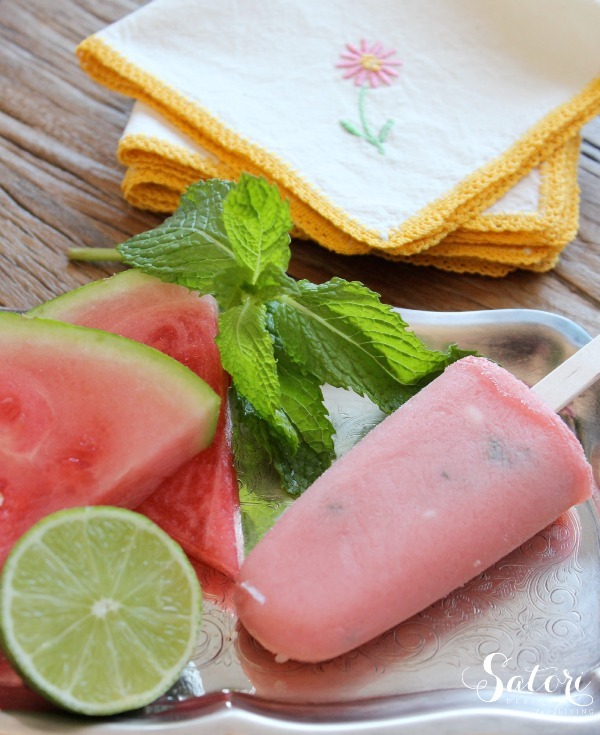 What a delicious combo with the watermelon, mint and Greek yogurt! Healthy and refreshing! These sound delicious, AND they look pretty too! I haven’t had watermelon yet this year—I think I’ll get some and use part of it for this recipe! Looks like a yummy sweet and cold treat! Yes, a little goes a long way with this recipe. You could probably make 3 or more batches with one regular watermelon. Cheap and cheerful! These look so yummy and refreshing! 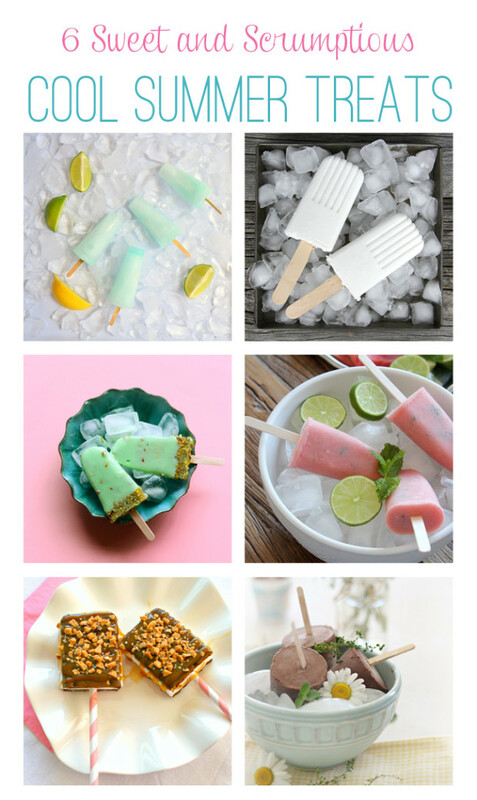 These look so refreshing, and your photographs are beautiful! Love the vintage linen napkins in the background! ;-) Your new site looks amazing, Shauna – I really like how crisp and clean it is! Congratulations!! Thanks Sheila! Still not totally finished, but almost there. A big change for me to get used to! Thanks Angie. The blog change is a work in progress but we’ll get there! Looks like a great recipe – I think my whole family would love those! These look so refreshing! Can’t wait for it to warmer to makes these. Love the addition of honey. One of my favourite things about Mexico City was the diversity of the food and the paleta stands there are always wonderful. Yes, healthy and delicious. I think the soy or coconut yogurt will work out just fine. Good luck! How refreshing! My daughter will love these. Hope she shares with me too! Yum, Shauna! These look so refreshing (not to mention gorgeous). Just pinned! Thank you! Ohhh Shauna! 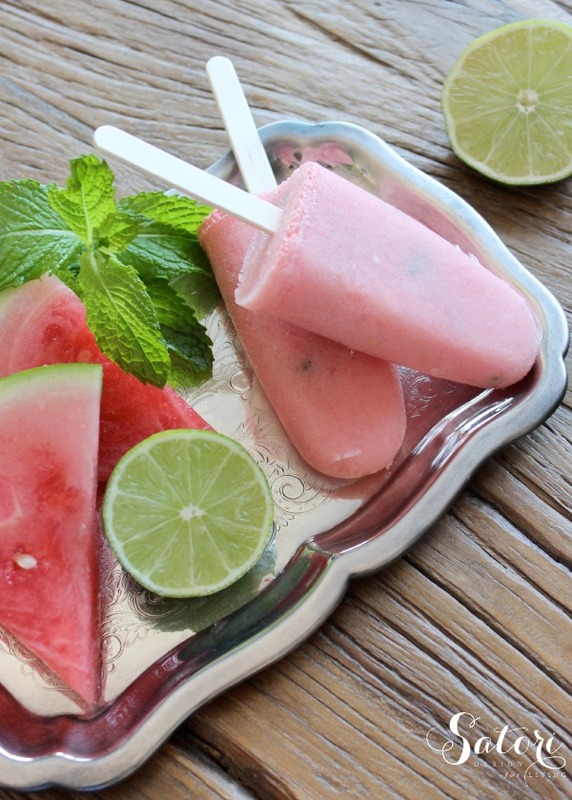 These look amazing and incredibly refreshing! Watermelon and lime – that just sounds like a killer combo. I really need to start making popsicles.